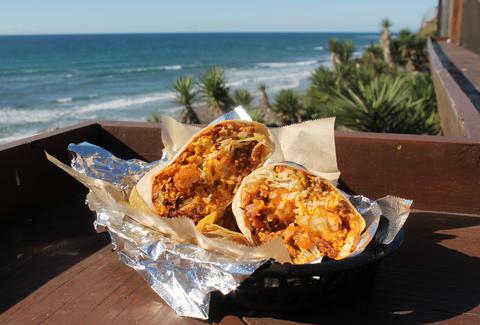 The only thing better than a California burrito is eating one with a view of California. 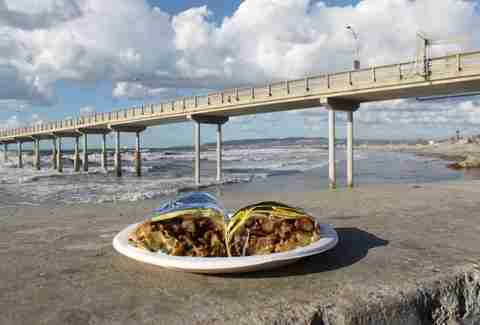 Ranging from counter service to sit-down style, these seven San Diego restaurants serve up appetite-crushing burritos alongside some of the city’s most scenic spots, from Balboa Park to the Pacific Ocean. Enjoy them with a burrito in one hand, and salsa in the other. Bull Taco has restaurants throughout North County, but the Cardiff ourpost is unquestionably the move if you’re looking for a side of scenery. Located inside the San Elijo State Beach Campgrounds, this location has sweeping views of the Pacific. 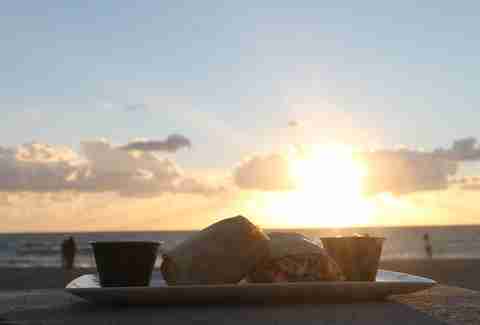 Grab an early-morning breakfast burrito while you watch paddleboarders duke it out in the surf. It's tough to take your eyes off the mix of crunchy tater tots, eggs, chorizo, bacon, and melted cheese, but don’t worry, it isn’t going anywhere. 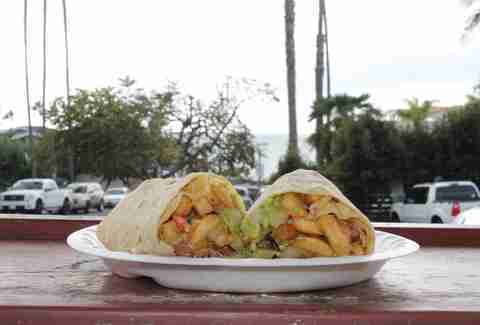 Don Bravo’s California burrito has crisp fries and tender Angus beef, which are made all the more delectable by the view of the beach. 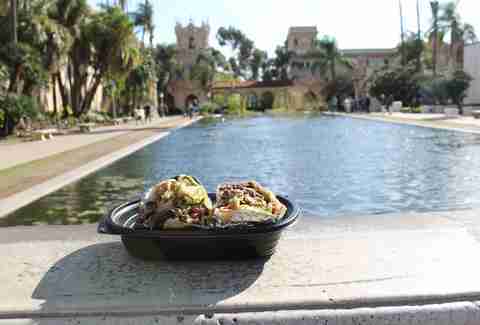 Saddle up to one of the outdoor patio seats to get a glimpse, while enjoying the savory Cali burrito. Once you're finished, grab a churro or horchata to satisfy your cravings. Roberto’s has 16 San Diego locations, but the Carmel Valley restaurant is the only one with a view of Torrey Pines State Reserve, for those times you want to see something beautiful without, you know, exerting yourself. The California burritos are consistently outstanding, but don’t sleep on breakfast options. The hash brown burrito is a morning favorite, packed with crispy hash browns and fluffy scrambled eggs. After mowing down one of these, it may just give you that energy you need to hit the trails. Or you may just want to nap. Despite having an ocean view in La Jolla, Jose’s Courtroom manages to be anything but pretentious. The vegetarian burrito is packed with color, just like the nearby skyline. Plus, a rotating selection of local craft beer on draft makes it a fine place to enjoy some suds without the fear of getting ticketed on the beach. 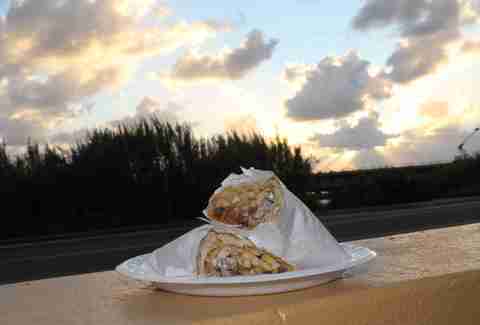 Señor Grubby’s is actually a block from the beach, but the view and the burrito both make the walk worth it. The shrimp diabla burrito comes with two sides, a mouthwatering Chipotle cream sauce and pico de gallo sauce that’ll make you forget that modest walk. Grab a beach blanket and enjoy a beautiful sunset picnic. Long walks on the beach optional. 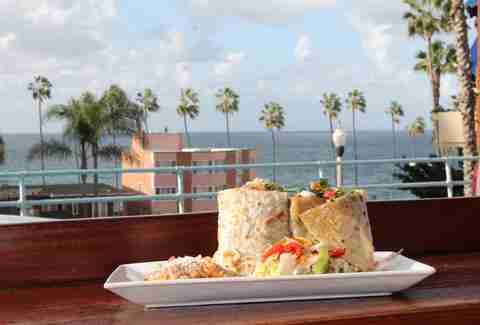 The Surfin’ Cali burrito is a step up from the usual California burrito, thanks to an abundance of shrimp. Take it to the Ocean Beach Pier where you can watch people that are also a step up from the usual. It makes for some serious people-watching since many of OB’s most interesting characters seem to congregate (or park their vans) there. Pro tip: be prepared to fend off hungry seagulls, which may or may not have happened after this photo. This counter-style restaurant inside the Casa de Balboa building is one of Balboa Park’s little-known spots. It’s like the Subway of burritos (in the sense of being fully customizable, not in the sense of having employed Jared). Take it to go and enjoy Balboa Park’s scenic reflection pools, which are just a few steps away. As a bonus, you can throw what you don’t eat to the ducks (which should be nothing, sorry ducks!). Afterwards, stroll through the Botanical Building, home to more than 2,000 exotic plants. Ellen Wright is a freelance writer for Thrillist who is in desperate need of a gym session after binge-eating burritos beachside. Follow her: @PacificPolished.